Left: A species of branching stony coral colonies releasing egg bundles into the water in Horniman's lab. Credit: Horniman Museum & Gardens. Right: Keri O'Neil at The Florida Aquarium's Center for Conservation with coral that has grown in the lab from wild spawning. Credit: the Florida Aquarium. The Florida Aquarium, based in Tampa, Florida, and the Horniman Museum and Gardens, based in London, have joined forces to save coral reefs by spawning (reproducing) corals in a lab – a major technique to aid coral restoration that has only been accomplished at the Horniman. Corals in the wild reproduce by releasing their eggs and sperm into the water at the same time, which is an event that is increasingly more uncertain given the changing climate. This wild spawning event only happens once per year, which has meant opportunities for research have been limited – until now. 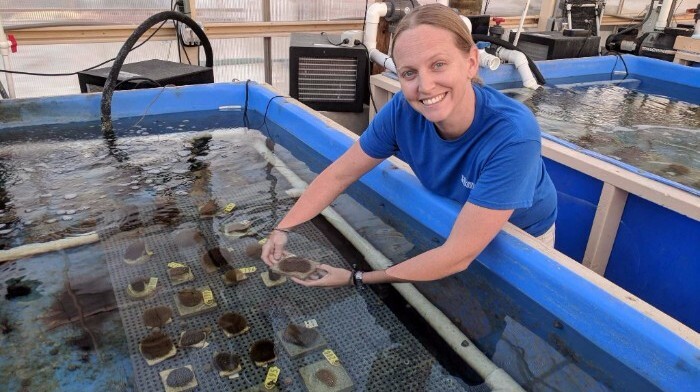 From Dec. 11 - 17, Keri O’Neil, The Florida Aquarium’s Coral Nursery Manager, will be visiting the Horniman to learn their techniques of growing corals in a lab setting and brainstorm ideas of how to transport future coral fragments to Florida for restoration purposes. The Horniman Aquarium started Project Coral and in 2013 became the first organization globally to predictably induce coral spawning in a fully closed aquarium lab setting. Now The Florida Aquarium is providing even more expertise to enhance this project with plans to plant the lab-grown coral fragments to coral reefs along the Florida Reef Tract. The new partnership with The Florida Aquarium takes the research protocols developed in the Horniman’s lab in Forest Hill, south London, and applies them in The Florida Aquarium’s state-of-the-art coral conservation nursery in Apollo Beach, Florida. “Project Coral is ‘game-changing,’ allowing us to spawn corals on site, create multiple spawning events across the year and drastically speed up restoration work to ensure the survival of Florida’s reef,” said Scott Graves, Director of The Florida Aquarium’s Center for Conservation. Project Coral is an innovative coral reproductive research project led by the Horniman Aquarium with international partners, working to predictably spawn corals in a lab setting in order to investigate, counter and repair the impact of climate change on coral reef health and reproduction. Since 2012, researchers at the Horniman Museum and Gardens Aquarium have been researching broadcast coral reproduction, developing protocols that replicate natural reef conditions – and the triggers for mass spawning events – in the lab, to predict and induce land-based spawning. Corals bred at The Florida Aquarium using Project Coral techniques – all from species listed as threatened under the U.S. Endangered Species Act – will be transplanted into the ocean to restore the Florida Reef off the state’s south eastern coast. Coral reefs are one of the most biodiverse ecosystems in the world and support about 25 percent of all marine life. In addition, they are important to the Florida economy as fisheries and a tourist attraction. The reef has suffered dramatically from bleaching events that occur when ocean temperatures rise, as well as pollution and other human-related environmental causes. Some scientists believe staghorn coral can no longer successfully sexually reproduce in the wild at all with these environmental challenges emerging. Thus, scientific groups like the ones formed by the Horniman and The Florida Aquarium are changing the game by spawning corals in a lab setting, allowing the corals to spawn more than just once a year. The increase in spawning occurrences will give the team a better chance to make a substantial impact on the restoration of corals. 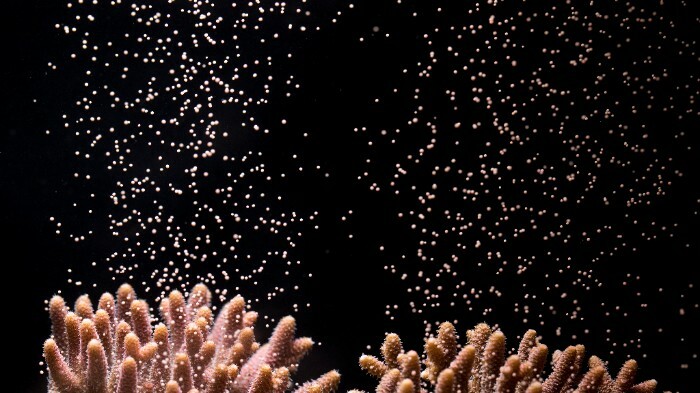 “Project Coral has made huge strides in creating the protocols to induce coral spawning in lab conditions, and the Horniman’s research will continue to refine the techniques and understand the effects of climate change on coral reproduction. But we need partners to be able to put our research into practice in the field. This partnership with The Florida Aquarium is Project Coral’s first opportunity to make a ‘real world’ change, and we look forward to seeing the positive effects our work together will have on Florida’s reefs” said Jamie Craggs, Aquarium Curator at the Horniman Museum and Gardens. The Florida Aquarium is a 501(c)(3) not-for-profit organization whose mission is to entertain, educate and inspire stewardship about our natural environment. The Florida Aquarium is accredited by the Association of Zoos & Aquariums (AZA).